A “Pink Shirt” protestor covers her mouth while she directs obscenities to Red Shirt protestors, who weren’t present, during the Pinks’ protest in Bangkok Friday. 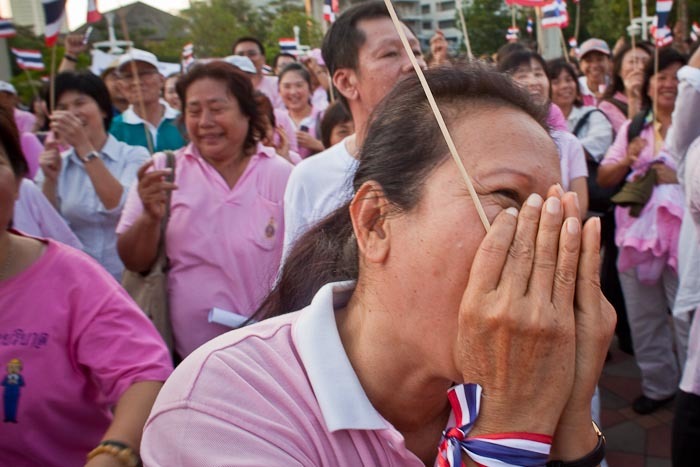 The ongoing political protests in Bangkok took a slightly different tack Friday when so called "Pink Shirts," those who are neither Red nor Yellow, took to the streets to demand an end to Thailand's ongoing political crisis. The Pink Shirts said they were educators, export businesses and people who work in the tourism industry, all economic sectors that have been hit hard by the Red Shirt protests that have gripped Bangkok for three weeks. It’s easy to poke fun at the colored shirts and the protests but to the Thais this is very serious. The Red Shirts, mostly farmers and poorer people from the countryside, revered Thaksin Shinawatra because he was the first elected official they felt represented their interests. The bureaucrats and Thai ruling class despised him for many of the same reasons. He didn’t represent their interests and he wasn’t a member of ruling oligarchy that has governed Thailand since the 1930’s. Despite the allegations of corruption and malfeasance, that’s the real reason the Thai army ousted him in 2006. And it’s the reason his proxies easily won the election in 2007, after the coup. The people in the countryside want Thaksin back (he promised change, like Obama, which is one of the reasons the Thais seem to be so smitten with our President). The establishment doesn’t want him back. They view the Red Shirts as country hicks who aren’t smart enough to vote properly, which is why their votes haven’t really counted. As for the shirts, color plays an important role in Thai life. Yellow is the color of Monday and of the Monarchy (because the King was born on a Monday). The Yellow Shirts had adapted yellow to show their allegiance to the King. Red is the color of Sunday and is thought to represent the traits of wisdom and respectability and some one who is beloved by friends and relatives. Pink is Tuesday’s color. The characteristics are brave, active, broad and serious minded. There are more photos from the Pink Shirts protest in my PhotoShelter archive and available from ZUMA Press.